48 incidents covering the last 3 days. An appliance from Cromer attended to an alarm activation, this was a false alarm caused by a system fault. An appliance from Earlham assisted a member of the public with a fuel leak on Devonshire Street. One appliance Great Yarmouth assisted the Ambulance. An appliance from Diss assisted Suffolk Fire & Rescue Service. An appliance from Watton attended to a large rubbish fire, the crews used hose reel jets to make the surrounding area safe and the rest is being allowed to burn safely. One appliance from Hingham was mobilised to an alarm sounding on Hardingham Road. This was a false alarm caused by a system fault. Appliances from Kings Lynn were mobilised to a road traffic collision on the A10. The crew used HRE to release a casualty from a vehicle and provided scene safety. Appliances from Downham Market, Methwold, Swaffham and the urban search and rescue team attended a fire at a commercial premises on Buckenham Drive, crews used hose reel jets to extinguish the fire whilst wearing breathing apperatus. Once the fire was extinguished the crews used a thermal imaging camera to check for hot spots. One appliance from Kings Lynn assisted the Ambulance. Appliances from Diss and Harleston assisted Suffolk Fire and Rescue Service. One appliance from Sprowston assisted the ambulance. One appliance from Carrow attended an alarm activation which was a false alarm. Appliances from Sheringham and Cromer were mobilised to a road traffic collision on Church Close. The crews provided casualty care and scene safety. Appliances from Methwold, Downham Market, Kings Lynn and USAR extinguished a fire on Buckenham Drive using ladders, main and hose reel jets. 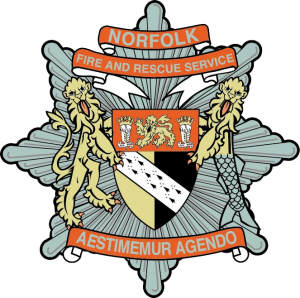 A crew from Aylsham were alerted to assist a person locked in on Mill Street but were stood down before the arrival of the Brigade. One appliance from Thetford attended reports of a fire in the open on Banham Cross Common. Crews used back pack sprayers to extingiush. Appliances from Dereham attended to reports of a building fire on Church Street. The fire was extinguished before the arrival of the Brigade but crews used a thermal image camera to check for hot spots and made sure the property was safe. One appliance from Earlham, One from Carrow and one from Hethersett were mobilised to reports of a road traffic collision on the A11 Hethersett. Crews were stood down before arrival. Appliances from Great Yarmouth and Gorleston attended to reports of a gas leak on Cunningham Avenue. The crew used gas monitors and isolated the leak from a cooker. The crew then ventilated the property. One appliance fromn Downham Market attended to reports of an alarm sounding on Churchill Way, this was a false alarm. One appliance from Diss attended reports of a fire in the open on the A140 in Dickleburgh. This was a false alarm. One appliance from Earlham attended a rubbish fire on Clifton Street. This was extinguished using hose reel jets and was deliberately ignited. An appliance from Carrow assisted the Police. An appliance from Sheringham attended a carbon monoxide alarm on Curtis Lane. Crews used a gas monitor and isolated the gas. An appliance from Earlham assisted the Police on A11. An appliance from Loddon assisted the Police on High Street. An appliance from Acle attended to a fire in the open on chapel road, this was a false alarm caused by controlled burning. An appliance from Gt Yarmouth assisted the ambulance service on Harry Miller Court. Appliances from Earlham and Carrow attended to a shed fire on Manor Farm Close, crews used compressed air foam to extinguish. An appliance from Martham attended a fire on the Marrams. This was a false alarm. Two appliances from Thetford assisted Suffolk Fire and Rescue Service in Rushford. A crew from Earlham attended a false alarm caused by controlled burning on Back Lane. Crews from Carrow attended on the Acle Straight to rescue a sheep stuck in a ditch. Crews from Earllham and Carrow were mobilised to reports of a vehicle fire on the A47. This was a false alarm caused by a mechanical fault. Appliances from Methwold and Long Stratton with the Misting Unit from Thetford attended Thetford Forest to forestry on fire in which crews utilised the misting unit and used back sprayers and hose reel jets to extinguish. Crews from Fakenham attended a hedgerow on fire in which they wore breathing apparatus and used hose reel and hand appliances to extinguish. A crew from Gorleston rescued a person who was stuck in a vehicle on Beccles Road. Appliances from Thetford, Sprowston, Attleborough, Methwold and the Aerial Ladder Platform from Earlham have attended a fire on Brunel Way. The fire involves a building 50m x 20m and firefighters used hose reel jets, main jets and compressed air foam to extinguish. They also used a thermal imaging camera to check for residual hot spots and a gas monitor.